Microbiome effect- How to interpret? When has it been the last time that i put some words up in this page. Seems to be a very long time before. For, I was busy and too much occupied and probably never had the time. And what did I miss. I missed some of the best stories. That said, includes story of paradoxical possibility of Normal flora in Brain Microbiome by Branton etal, Fungal microbiome story (Link), how our placental cells tackles virus infection (Delorme-Axford etal; Link), Women are more prone to infections (Link), Phage system as possible part of our innate immune defense (Link) and many more. Oooh. I missed so much. But the actual Bang in microbiology that "Infectious disease", are most concerned about right now is the MERS coronavirus. Its now much late to talk about it. A complete and very stimulating discussion can be found at TWiV 239 podcast (Link). 1. If Adv36 (Adenovirus 36) is involved with diabetes then should we think of antiviral treatment?? (Adv36 is used here as an example for cause and effect relationship). 2. Its been shown that substances such as ROS (Reactive oxygen species) and RNS (Reactive Nitrogen species) is involved in many disease. Justification of involvement with microbiome?? Coming to the first question. A conclusion statement from a paper may read something like this. Our study suggests that there is a significant increased risk (or association) of Y due to organism X in our research setting. In this case Y is a condition and X is some microbe. The first take by most of the reader is X leads to Y. The point is, on a broader picture its not. Here's an explanation. Most of the studies that i know of that has to do with above quality of statement is done on animal models, especially gnotobiotic mice. The analysis variable is single variable. Though this is the standard approach for several reasons, such as avoiding confounding effect the interpretation at a larger scale mayn't be the same. In the research setting, the gnotobiotic mice had interacts with only one organism. Whatever is the effect, is measured. In case of normal population, there are other members in microbial flora too. Some produce the positive effect, some negative effect. In totality the outcome will depend on multiple variables. In any given study it is rather impracticable (At least in current research ability) to do a multi- variable study of the magnitude considering 30000 plus members. Another important point often people miss. "Association is not causation". Now apply the logic to first question. In the post on Adv-36 and its link to obesity (Link), I argued the basis on how Adv 36 is a possible trigger for obesity. However, antiviral is not a good option. It also depends on environmental factors, genetics etc. Clearly only a subset of population is Adv effected. The Adv 36 trigger lays down the required condition for the onset of condition in individuals who are predisposed by other factors also as shown in Fig 1. Hence doesn't qualify for a antiviral. Tracking the second question. Yes, it is true that most of the disease encountered has been traced to ROS or RNS dys-regulation. No doubt about that. But what causes the dys-regulation in the first place. Assuming that the cells are functioning normally someone has to interfere. This is the point where microbes chime in. 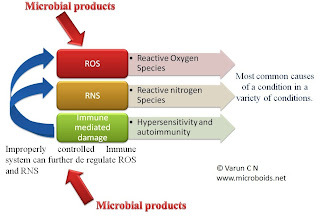 The argument is Microbes interfere at some point in cell signalling by a variety of mechanisms (enzymes, proteins, cross reacting antigens etc) and brings in the ROS/ RNS imbalance leading to the condition. The clear effects of such phenomenon is now studied under separate branch such as Microbial endocrinology. 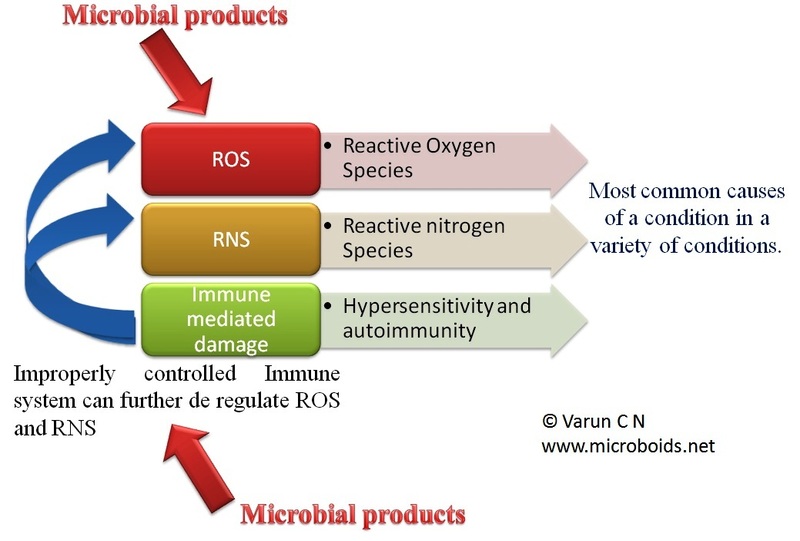 If you are still not convinced refer to any pathogen literature and your bound to see virulence factors interacting with ROS, RNS and Immune products. In many settings the pathogen will damage a cell but will maintain the damaged cell alive (by blocking process such as apoptosis) leading to said conditions. But again, just as in previous argument to question 1, the events lay a platform and shows up enhanced as a condition when other factors join in. A simple ROS de regulation will not lead to Alzheimer's. In the light of what is said above, I want to mention a paper that showed that the cardiac drug digoxin was not working well in certain patients. Reason? The drug was inactivated by a particular strain of Eggerthella lenta a member of normal flora by converting into an inactive form, dihydrodigoxin. Now am thinking, there might be some strain of microbe in our flora. Turnbaugh, an author of the paper comments "The traditional view of microbes in the gut relates to how they influence the digestion of our diet, but we also know that there are over 40 different drugs that can be influenced by gut microbes. What's really interesting is that although this has been known for decades, we still don't really understand which microbes are involved or how they might be processing these compounds." Source.